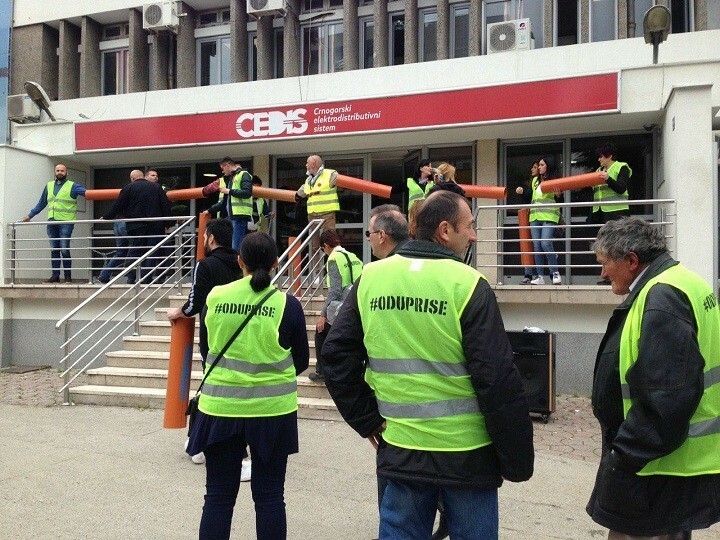 Citizens and activists of the movement “Resistance 97 000”, about 20 of them, blocked the entrance of the buildings of the Montenegrin Electricity Distribution System (CEDIS) and Elektroprivreda in Podgorica. These institutions provide electric power to citizens in the country. Citizens and activists have sat in front of the entrance and hold electricity bills. On Saturday, the movement announced that they would organize non-violent actions in all cities in Montenegro this week, as they said, blocking the system and forcing the authorities to accept their demands. “We will block the system until they leave. We will be persistent, we will work all the way to the end”, they said at a protest. Citizens and activists used chains and did not allow anyone to enter or leave the buildings. Demir Hodžić urged citizens to join them as much as possible in the blockade. He also invited the MPs to join them. “There will be no ‘sugar coating’ and no negotiations, only resignations”, Hodžić said. During the protest, two activists were transferred to the Clinical Center of Montenegro because they did not feel well. The Prava Crna Gora party (True Montenegro) denounced that activists were transported by ambulance because there was an attack on members of the movement, strongly condemning the incident. As they said activists were attacked by an unknown person who, allegedly violently, started to break the human chain in front of the entrance door of the Elektrodistribucija in Podgorica. Party president, Marko Milačić, requested swift action by the police for the identification of the attacker. “Demonstrators, who in their own an original way expressed their revolt as a result of the announcement of new and higher electricity price, peacefully protested in front of the aforementioned state-owned company. All this was watched by police officers, who additionally ensured the safety of the employees in CEDIS”, Milačić said in a statement. He explains that this also implied blocking the front entrance of the CEDIS building, so many employees used the rear entrance. “The situation escalated when an unknown person, who entered the building through the back door, violently attacked the demonstrators, injuring several women who ended up in an ambulance. One of the attacked women is Danijela Đurišić, who has been arrested several times for fighting for her property in Jerevan Street and Zabjelje”, Milačić said in a statement.